Ricoh is a global manufacturer of office equipment and conducts business on a global scale. Ricoh is exposed to various risks which include the risks listed below. Although certain risks that may affect Ricoh's businesses are listed in this section, this list is not conclusive. Ricoh's business may in the future also be affected by other risks that are currently unknown or that are not currently considered significant or material. In addition, this section contains forward-looking statements, which are based on our judgments at the date of submission of the securities report. No assurances can be given that Ricoh will be able to respond adequately to changes in the industry. Ricoh's failure to respond to any risks associated with this industry, including those described above, may adversely affect Ricoh's future growth and profitability as well as its financial results and condition. Ricoh is continually faced with the risk of fierce competition, shift in demand to low-priced products, shorter product life cycles, threats of new entrants and substitute products in the business segments it operates in. While Ricoh is a leading manufacturer and distributor in the document imaging and management industry and intends to maintain its position, no assurances can be made that it will continue to compete effectively in the future. Pricing pressures or loss of potential customers resulting from Ricoh's failure to compete effectively may adversely affect Ricoh's financial results and condition. Ricoh's inability to manage successfully the risks inherent in its global business activities could adversely affect its business, financial condition and operating results. 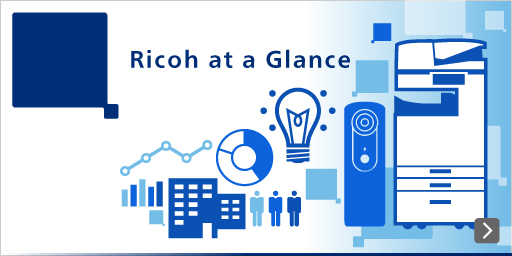 Demand for Ricoh's products are affected by cyclical changes in the economies of Ricoh's major markets, including Japan, the United States, Europe and Other regions such as China. Economic slowdown and a decline in consumption in Ricoh's major markets may adversely affect Ricoh's financial results and condition. Local currency denominated financial results in each of the Company's subsidiaries around the world are translated into Japanese yen by applying the average market rate during each financial period and recorded on Ricoh's consolidated statement of profit or loss and consolidated statement of comprehensive income. Local currency denominated assets and liabilities are translated into Japanese yen by applying the market rate at the end of each financial period and recorded on Ricoh's consolidated statement of financial position. Accordingly, the financial results, assets and liabilities are subject to foreign exchange fluctuations. In addition, operating profits and losses are especially subject to foreign exchange fluctuations. Because of the high volume of Ricoh's production and sales activities in the United States, Europe and Other regions such as China, Ricoh has a high ratio of profits and losses denominated in foreign currency. Ricoh enters into foreign exchange contracts with financial institutions to hedge against the short-term impact of fluctuations in foreign currencies such as the U.S. dollar, the Euro and the Japanese yen, effectively. However, if the medium and longterm foreign exchange fluctuations make Ricoh's procurement, production, logistics and sales activities difficult, such events may adversely affect Ricoh's financial position and results of operations. Ricoh relies on externally sourced raw materials in its manufacturing operations, and it does business with a broad range of suppliers to ensure steady supplies of high-quality raw materials at competitive prices. Many of the parts or materials used in manufacturing Ricoh's products are made from oil. If the price of crude oil rises, the purchase price of such parts or materials may increase as well. Further, unanticipated contingencies among these suppliers or if parts and materials procured by these suppliers suffer from quality problems or are in short supply, Ricoh may be forced to discontinue production. Such events could adversely affect Ricoh's financial position and results of operations. Ricoh is subject to various governmental regulations and approval procedures in the countries in which it operates. For example, Ricoh may be required to obtain approvals for its business and investment plans and be subject to export regulations and tariffs as well as rules and regulations relating to commerce, antitrust, patent, consumer and business taxation, exchange control and environmental and recycling laws. Ricoh has established a CSR organization to heighten awareness of the importance of corporate social responsibility. Through CSR, Ricoh involves its employees in various activities designed to ensure compliance with applicable regulations as part of its overall risk management and compliance program. However, if Ricoh is unable to comply with any of these regulations or fails to obtain the requisite approvals, Ricoh's activities in such countries may be restricted. In addition, even if Ricoh is able to comply with these regulations, compliance can result in increased costs. In either event, Ricoh's financial results and condition may be adversely affected. Ricoh owns or licenses a number of intellectual property rights in the field of office equipment automation and, when Ricoh believes it is necessary or desirable, obtains additional licenses for the use of other parties' intellectual property rights. If Ricoh fails to protect, maintain or obtain such rights, its performance and ability to compete may be adversely affected. Ricoh has a program in place under which company employees are compensated for any valuable intellectual property rights arising out of any inventions developed by them during the course of their employment with Ricoh. While unlikely, management believes that there could arise instances in the future where Ricoh may become the subject of legal actions or proceedings where claims alleging inadequate compensation are asserted by company employees. Ricoh believes that in order to maintain mid- to long-term competitiveness, securing and retaining highly skilled personnel at the right time is essential. Ricoh has placed emphasis on securing and retaining such personnel. However, failure by Ricoh to recruit and train qualified personnel or the loss of key employees may adversely affect Ricoh's future growth, financial results and condition. With respect to its employee benefit obligations and plan assets, Ricoh accrues the cost of such benefits based on applicable accounting policies and funds such benefits in accordance with governmental regulations. Currently, there is no immediate and significant funding requirement. However, if returns from investment assets continue to decrease and/or turn negative due to market conditions, such as with fluctuations in the stock or bond markets, additional funding and accruals may be required. Such additional funding and accruals may adversely affect Ricoh's financial position and results of operations. Ricoh is exposed to risks from the effects of climate change. They include the “Transition risk” to a decarbonized society such as the increased manufacturing and sales costs due to the strengthening of regulations on environmental labels and introduction of carbon taxes and the loss of sales opportunities due to inability to react to market demand driven by sustainability in a timely manner and "Physical risk" as a result of extreme climate events which cause suspension of product supply and disruption of the supply chain. Ricoh sets environmental targets for 2030 and 2050 aligned with our mid- and long-term management plans on a global level as a mitigation measure related to climate change. We develop environmental action plans every three years to achieve the targets by managing the PDCA cycle. In addition, we became the first Japanese company to join RE 100, an international initiative to actively utilize renewable energy. However, if climate change measures are delayed, there is a possibility that business results and financial condition may be adversely affected by the risks associated with transition to a decarbonized society and physical risks of extreme climate events. Ricoh's operations are subject to many environmental laws and regulations governing, among other things, air emissions, wastewater discharges, the use and handling of hazardous substances, waste disposal, product recycling and soil and ground-water contamination. Ricoh faces risks of environmental liability in our current and historical manufacturing activities. Costs associated with future additional environmental compliance or remediation obligations could adversely affect Ricoh's business, operating results and financial condition. Ricoh provides financing to some of its customers in connection with its equipment sales and leases. Ricoh evaluates the creditworthiness and the amount of credit extended to a customer prior to the financing arrangement and during the financing term on a regular basis. Depending on such evaluations, Ricoh makes adjustments to such extensions of credit as it deems necessary to minimize any potential risks of concentrating credit risk or nonpayment. Despite the application of these monitoring procedures, no assurances can be made that Ricoh will be able to fully collect on such extensions of credit due to unforeseeable defaults by its customers. In addition, these financing arrangements that Ricoh enters into with its customers result in long-term receivables bearing a fixed rate of interest. Although Ricoh finances these financing arrangements with short-term borrowings subject to variable interest rates along with borrowings subject to fixed interest rates whose terms are matched with the term of the financing arrangements for the purpose of hedging the interest rate risk, Ricoh is not able to fully hedge this interest rate mismatch. If Ricoh is unable to successfully manage these risks associated with its equipment financing business, Ricoh's financial results and condition may be adversely affected. Ricoh may be held responsible for any defects that occur with respect to its products and services. Depending on the defect, Ricoh may be liable for significant damages which may adversely affect its financial results and condition. Furthermore, as Ricoh increasingly provides products and services utilizing sophisticated and complex technologies, such defects may occur more frequently. Such potential increase in defects, which could result in an increase in Ricoh's liability, may adversely affect its financial results and condition. In addition, negative publicity concerning these defects could make it more difficult for Ricoh to attract and maintain customers to purchase Ricoh products and services. As a result, Ricoh's financial results and condition may be adversely affected. Ricoh engages in alliance with entities to create various products and services to fulfill customer demand. Ricoh believes that alliances are effective for the timely development of new technology and products using management resources of both parties. However, if Ricoh's interest differs from other parties' interests due to financial or other reasons, Ricoh may be unable to maintain the alliance. Ricoh also makes strategic investments to acquire interests in companies that Ricoh believes would support existing businesses and/or lead to new businesses. Such strategic investments may not necessarily lead to the expected outcome or performance and may result in increased time and expenses being incurred due to the integration of businesses, technologies, products and/or personnel necessitated by such investments. Accordingly, these types of management decisions may have a significant impact on the future performance of Ricoh. Failure to maintain an on-going alliance, establish a necessary alliance or make a strategic investment to acquire an interest in a company may adversely affect Ricoh's future financial position and results of operations. Ricoh obtains confidential or sensitive information from various sources, including its customers, in the ordinary course of business. Ricoh also holds trade secrets regarding its technologies and other confidential or sensitive information relating to marketing. To prevent unauthorized access and/or fraudulent leakage or disclosure of such confidential or sensitive information, Ricoh has implemented an internal management system which includes measures to improve security and access to its internal database and employee training programs to educate its employees with respect to compliance with applicable regulations relating to information security and data access. Despite Ricoh's efforts, however, confidential or sensitive information may be inadvertently or accidentally leaked or disclosed and any such leakage or disclosure may result in Ricoh incurring damages which may adversely affect Ricoh's reputation. In addition, Ricoh may incur significant expenses for defending any lawsuits that may arise from such claims. Furthermore, the leakage or disclosure of Ricoh's confidential or sensitive marketing and technological information to a third party may adversely affect Ricoh's financial results and condition. Ricoh will do its utmost to ensure the continuation of business activities and fulfill its social responsibilities as a corporate citizen in the event of an earthquake, fire, hurricane, flood or other natural disaster, pandemic such as from a new strain of influenza or other unpredictable events. Measures taken to mitigate such risks include periodic inspections of equipment and facilities, conducting disaster drills, implementation of systems to confirm employee safety and formation of a business continuity plan. In spite of these measures, however, an earthquake on a scale beyond our expectations or other disasters or events that may temporarily suspend operations could adversely affect Ricoh's financial results and condition. Ricoh recognizes goodwill in relation to acquisitions and various tangible assets or intangible assets for business operation. There might be harmful effects on business results or financial positions of Ricoh when expected cashflows could not be generated by failure to meet the target or other. As described in “V. FINANCIAL INFORMATION 34. Subsequent event,” on January 29, 2018, Ricoh India Limited filed a petition to initiate the corporate insolvency resolution process. The petition was admitted, an interim resolution professional has been appointed, and Ricoh India will begin restructuring. In this process, there might be harmful effects on the business results or financial positions of Ricoh depending on decisions by the creditors committee, which consists of Ricoh India's financial creditors and the National Company Law Tribunal.